Give a giggle. Deliver a cheesy hand-stamped punch-art card that is sure to make your loved one giggle. 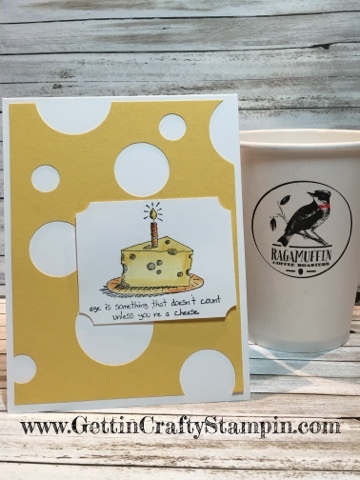 Created at a recent Connect, Create over Card Making and Coffee Monday mornings at Ragamuffin. Join Us at fun upcoming card making classes where you, too, can connect and make friends while creating sweet or cheesy hand-crafted cards like this! It isn't cheesy to give some giggles wrapped up in a cute hand-stamped punch-art birthday card. This cute Giggle Greetings is a must have for super cute cards! Stamp this birthday greeting using the Black Archival ink pad on the Thick Whisper White card stock. Color in using the Aqua Painter, Daffodil Delight and Pumpkin Pie ink pads for a cute water color look. Punch the Daffodil Delight card stock with the 1/2", 1" and 1-1/4" Circle Punches to create this punch art cheese accent. Punch the corners with the 1/2" Circle Punch and layer over the punch-art cheese with the Stampin' Dimensional adhesive (140430) for some depth. Deliver a cute birthday card that is fun, easy and sure to deliver some giggles. 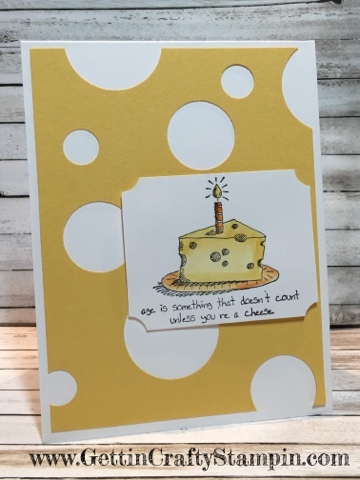 This water colored card is easy to create while sure to add cheese to someone's birthday! Join Us at upcoming card making classes and you, too, can create and send some love into the world.